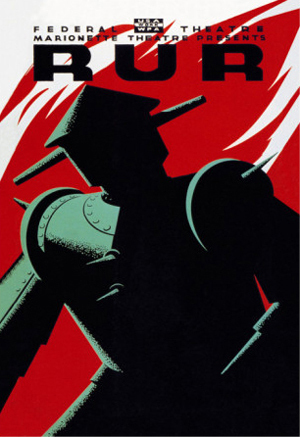 Join Cultural Programs of the National Academy of Sciences and the Shakespeare Theatre Company for a staged reading of R.U.R., a 1920 science fiction play by Czech writer Karel Capek which introduced the word "robot" into the English language. The reading runs approximately two and a half hours and includes a 15 minute intermission. Featuring John Lescault, Kimberly Gilbert, Rick Foucheux, Tim Getman, Hugh Nees, Harry Winter, Bev Appleton, Jefferson Russell, Joe Isenberg, Lee McKenna, Nora Achrati, Thony Mena, Jacob Yeh, Manu Kumasi, Joy Jones, Nick Byron, and Matthew McGee. Suggested viewing before attending: Watch Dennis Jerz speak about R.U.R.